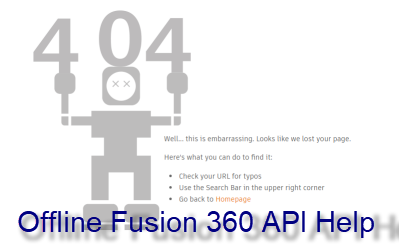 The help system for Fusion 360 was recently temporarily offline and as a result many of you saw the 404 message displayed above. For those of you using the API, you know how critical access to the help system is. When I was responsible for creating the Fusion 360 API help, the help system that produced it created the table of contents and the HTML files for the online help, but because it was originally developed to support the Inventor API, it also creates a chm version of the help files. For those of you unfamiliar, chm stands for “Compiled HTML” and is a single file that contains all of the help documentation. Because it contains everything it can be used standalone and doesn’t require access to the internet. It’s a Microsoft invention that is still used but I believe is no longer officially supported. It can be opened directly on a Windows machine and there are apps for Mac that will allow you to open it there too. With a brief search, I found both free and paid apps for Mac but I can’t comment on how good they are or recommend a particular one because I haven’t used them and don’t know. When you download it to a Windows machine and open it, some of the content won’t display correctly. 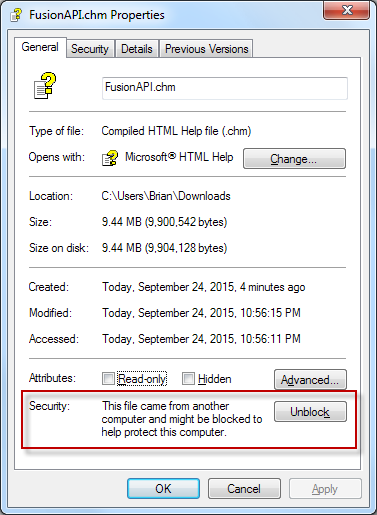 That’s because Windows is blocking some of the content until you indicate the file is safe by using the Properties command in the context menu for the chm file. Click the “Unblock” button as shown below, and then open the file and it should display correctly. You can download the CHM file here. Thanks for saving the day here!! Also on Mac I found a free program to open the file”CHM reader”.